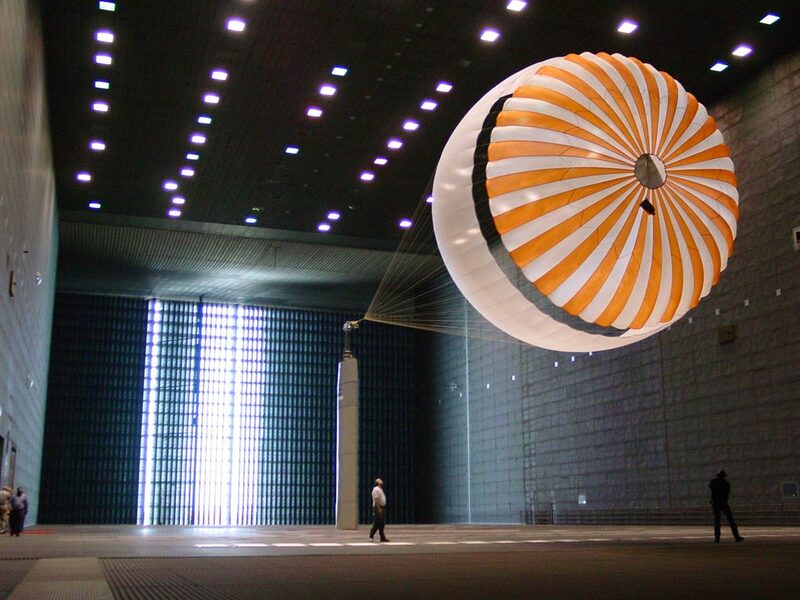 The parachute helps slow the spacecraft down during entry, descent, and landing. It is located in the backshell (green canister in the model to the left). What is the parachute's design? The design of the parachute is driven by "loads" (the forces the parachute experiences as it fully inflates). Loads are calculated by using atmospheric density, velocity, parachute drag area, and mass. 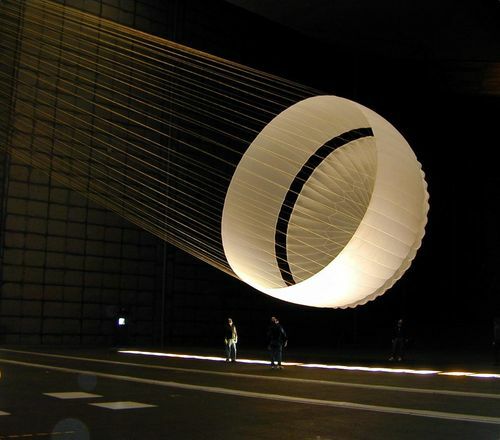 The 2003 parachute design is part of a long-term Mars parachute technology development effort and is based on the designs and experience of the Viking and Pathfinder missions. 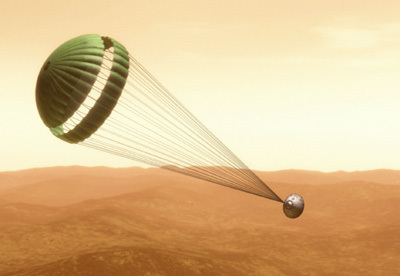 The parachute for this mission is 40% larger than Pathfinder's because the largest load for the Mars Exploration Rover is between 18,000 and 19,000 pounds (80,100 - 84,600 N*) when the parachute fully inflates. By comparison, Pathfinder's inflation loads were approximately 8,000 pounds (35,600 N*). What is the parachute made of? Mars Exploration Rover parachute deployment testing in the world's largest wind tunnel at NASA's Ames Research Center, Moffet Field, Calif. The parachute is made out of two durable, lightweight fabrics: polyester and nylon. The parachute has a triple bridle (the tethers that connect the parachute to the backshell). This bridle is made out of Kevlar, the same material used in bullet-proof vests. The materials used to make the parachute must be strong, yet lightweight enough to fit inside a very small area and to prevent excess weight within the backshell. The amount of space available on the spacecraft for the parachute is so small that the parachute must be pressure packed. Before launch, a team must tightly fold together the 48 suspension lines, three bridle lines, and the parachute. The parachute team loads the parachute in a special structure that then applies a heavy weight to the parachute package several times (like sitting on a suitcase to pack down clothes to fit inside). Before placing the parachute into the backshell, the parachute is heat set to sterilize it. What parts work in tandem with the parachute? Zylon Bridles: After the parachute is deployed at an altitude of about 10 km (6 miles) above the surface, the heatshield is released using 6 separation nuts and push-off springs. The lander then separates from the backshell and "rappels" down a metal tape on a centrifugal braking system built into one of the lander petals. The slow descent down the metal tape places the lander in position at the end of another bridle (tether), which is made of a nearly 20-meter-long (65-foot-long) braided Zylon. Zylon is an advanced fiber material similar to Kevlar that is sewn specifically in a webbing pattern (like shoelace material) to make it stronger. (Zylon is often used in lines for sailing here on Earth.) The Zylon bridle provides space for airbag deployment, distance from the solid rocket motor exhaust stream, and increased stability. The bridle incorporates an electrical harness that allows the firing of the solid rockets from the backshell as well as provides data from the backshell inertial measurement unit (which measures rate and tilt of the spacecraft) to the flight computer in the rover. 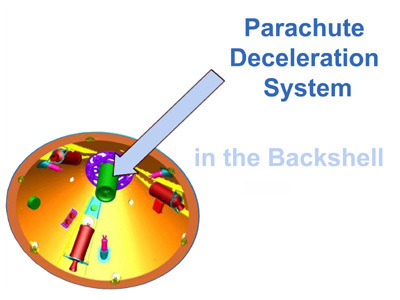 Rocket assisted descent (RAD) motors: Because the atmospheric density of Mars is less than 1% of Earth's, the parachute alone cannot slow down the Mars Exploration Rover enough to ensure a safe, low landing speed. The spacecraft descent is assisted by rockets that bring the spacecraft to a dead stop 10-15 meters (30-50 feet) above the Martian surface. More on RAD motors ››. Radar altimeter unit: A radar altimeter unit is used to determine the distance to the Martian surface. The radar's antenna is mounted at one of the lower corners of the lander tetrahedron. When the radar measurement shows the lander is a few meters (feet) above the surface, the Zylon bridle is cut, releasing the lander from the parachute and backshell so that it is free and clear for landing. The radar data also enables the timing sequence on airbag inflation and backshell RAD rocket firing.